The Villas in the Piedra Blanca estate enjoy exquisite views of the surfbreak, the beach, the Sayulita point, and miles of the azure Pacific Ocean. Only a few blocks (300 meters) to the premier Sayulita beach. Casa Roca when rented with Casa Azul will accommodate up to 20 guests (16 adults plus 4 kids) + with 7 bedrooms The villas share a pool deck. There are two amazing infinity pools and a large outdoor entertainment area. The Piedra Blanca Estate has beautiful landscaping with soft landscape lighting. THE BEST Sayulita location on the sought after north side. * No Downtown live music noise!! Piedra Blanca estate is perfect for large families or groups with 2 villas rented together, as a 6 or 7 bedroom place. Wedding Parties can be accommodated for up to 150 Guests! Please visit our Event Venue page for more information. We have a massive, beautiful garden with an infinity pool overlooking the Sayulita Bay for weddings that will accommodate up to 150 Guests! Everything Sayulita has to offer is as close as walking out the front door. We have umbrellas, beach chairs and custom Golf Cart is included, so it's zero hassle. We are only 300 meters from the surf. The Villas of Piedra Blanca are new, so it is quiet if you close the windows as they are soundproof; or you can listen to the ocean with the doors open. Either way, its a combination that ensures you get what you want. 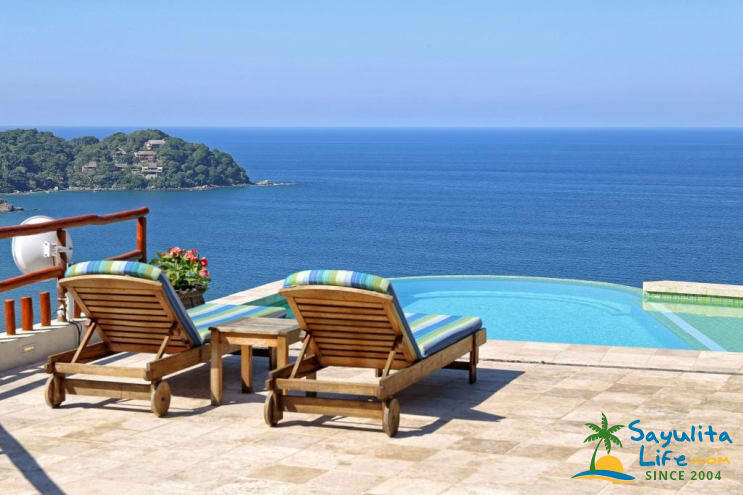 We look forward to welcoming you to Piedra Blanca Estate, for your Sayulita vacation... Here you can relax, have a drink, surf, read, or whatever your heart desires. The two villas together--with their beautiful view--were great for our large extended family. We enjoyed all the seating in the kitchen and around the two (of the three) pools. Two very large refrigerators were plenty for us--plus the large one up at the third pool. the hard part for us was getting into town. The golf cart was down for two days, walking down with strollers and our few elderly family members was out of the question. We had to hire x-large vans back and forth many times. The third pool was lovely, but the drive/path was sooo steep it was dangerous going up and down. We really didn't get to enjoy it. THE BEST HOUSE EVER. - First off, the photos does not do this estate any justice. The property is beautiful! You have to see it for yourself!!! - Check In was seamless...although not going to lie - we arrived right before sunset, and got stuck outside mesmerized by the VIEWS!! - Yarib was a dream host. Quick to reply, and provided excellent recommendations. - House has everything you need! Even a yoga mat and a grassy area to picnic on. So amazing. - Our groups started humming the Jurassic park themes song every time the gate opened and closed. You'll do it too!! That how gorgeous his place is. - If safety is your concern, worry not! Yarib has security system installed, not to mention you are basically in a castle at the top of a hill completely fenced in by 15 for high walls. You’re good! - the Golf Cart was a real treat! Made it easy to zoom in and out of town...but don’t forget to “cool the wires down after the initial hill” haha (I know that doesn’t make sense to you now...but you’ll get it once you stay here) - I should also mention the house keepers were so nice....did not expect to get the house changed over (cleaned) twice during our stay. That was a real treat! Especially for my large group of 15. - if you’ve read up to this part, you have to be hooked. Book it! Great home. Accommodate 14 easily. Best view of the bay. Martin did a great job! Would highly recommend. We just got home from an amazing trip to Sayulita! We rented 2 of the houses for my husbands 50th birthday and it couldn't of been better! We loved the houses, the views were the best and Martin was incredible! He helped me plan and make this party go off with out any problems at all! We will definitely be back and highly recommend these villas. We celebrated my wife's 50th birthday at Piedra Blanca with 12 of our closest friends! We had the time of our lives. Let me begin by saying Yarib is the best. She told us everything we needed to know before we traveled. She recommended airport transportation that was awesome. She had Martin meet us at the home to check us in and show us around. He made us feel like family! The estate is breathtaking - like the best Ritz Carlton! 7 Gorgeous Bedrooms, 7 Bathrooms, 2 beautiful kitchens, 2 pools, COME ON ! What else do you need. Oh I forgot, a gorgeous outside palapa area with a grass area, ANOTHER POOL, refrigerator and bathrooms! Martin organized a birthday party for us at the palapa with Mariachis and a birthday cake! What a great time! I'm so glad you enjoyed your stay and found Villas Piedra Blanca a memorable experience! Thank you for taking the time to write us a great review. I appreciate it! I hope you will come and visit again soon. Take care! And thank you so much for your feed back, I will work on that right now!! Option 1:Casa Roca with Casa Azul with 6 BR will accomodate 12 adults plus 2 little kids.